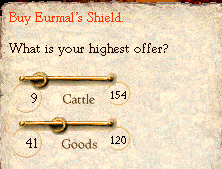 The votes that didn't want to decline the treasure were all in the neighborhood of offering 40-50 cows' worth of stuff. Goods are less useful to us than actual cows, so I mostly offer those. We're now the owners of one (currently useless) polished shield. Go us. 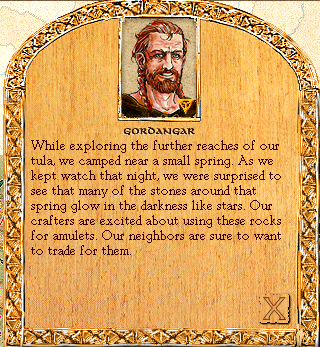 Meanwhile, Gordangar's exploration party has found the first of many materials that give a boost to our trade. To use them, we have to specifically assign the crafters to them - this takes up a turn, so it's often better to wait until you've found several materials before assigning crafters to them. 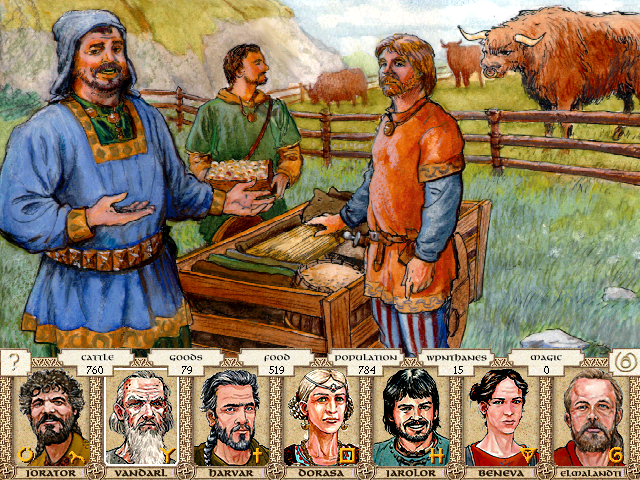 Mordrim the Stout, a prosperous farmer from the Woodpecker clan, and his sons Korlmar and Harnkorl, arrive at your tula. "I understand you have Eurmal's Shield. I am prepared to offer 40 cows worth of goods for it." We don't know what he'll do if we refuse his offer. It's difficult to put a value on a unique treasure. However, 40 is not enough. We can assure Mordrim's friendship by making him a gift. I'm not sure we can trust this fellow. He didn't end up "The Stout" by being on the short end of deals. I wonder if those boys are married, or if they'd be interested in meeting some of our unmarried girls?